Somehow this band managed to escape my notice, even though its debut came out in 2001; the band is from Austin, which I called home for six years and still visit annually; the band has played festivals like Noise Pop, Wall of Sound, and SXSW, where the trio snagged the title of Best Experimental Band. Thanks to my cousin, Douglas, for turning me on to The Octopus Project! Machines don’t make music — people do. And going by the bright action-packed gurgle, bam and squeak of their third album, the Octopus Project — a mostly instrumental analog-electronics dance band from Austin, Texas — are smart pop scientists and total party animals, like Stereolab with happy feet. And a stopwatch — the thirteen songs on Hello, Avalanche (Peek-A-Boo) are all tightly composed bundles of synthesized whoop and circus-calliope cheer, dotted with throaty Duane Eddy-treble guitar and powered by prancing-elephant drumming. The closest thing here to conventional club-remix electronica is the thumping near-techno of “MMAJ.” But for all of the willful yesterday in the Octopus Project’s discothèque blend of Switched-On Bach and Kraftwerk’s Autobahn, there is a delightful, disciplined modernism in the album’s brisk parade of hooks and the songs’ densely layered brevity. Compared to the purple-surf rock of “Bees Bein’ Strugglin’ ” and the mermaid-choir effect of Yvonne Lambert’s theremin in “I Saw the Bright Shinies,” the Prodigy are so 1997. 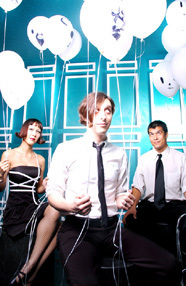 You'll find about a dozen great songs by The Octopus Project on their website. Enjoy!